I don’t REALLY know why I didn’t get around to packing the bag before I went into labor. Perhaps I was avoiding the reality of labor, or maybe I just had other things on my pre-baby to-do list (third trimester checklist) that seemed more important. Those both seem like valid reasons. So i just ran around grabbing stuff. Any stuff, really. Things that seemed like they might be useful while you’re trying to get a baby out, and things that I had heard I might need. This is a bad bad way to do this, and having a labor bag packing list on hand is probably wise. Related: Should You Bother Taking a Prenatal Class? 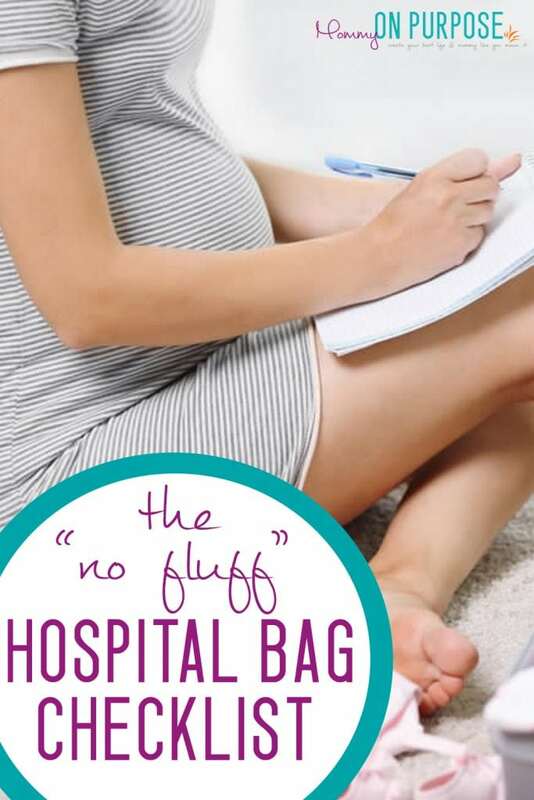 Is it just me, or is there an abundance of “fluffy” pregnancy hospital bag checklist articles out there? I am a sort of basic kinda girl… I did not pack the “extra stuff” in my hospital bag – music to labor to, or nursing nighties. Like, we know we’re not moving into the hospital, right? 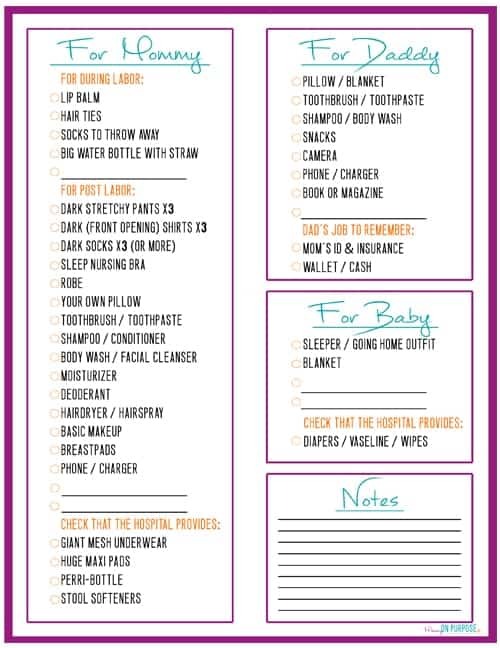 I can’t decide if authors of these labor and delivery bag checklists legit DO take that much stuff with them to the hospital, or if they’re just trying to come up with more stuff to write. Or maybe they add the fluffy stuff to make the birth experience seem more exciting and less… messy. I dunno. So there I was, at the hospital with a bunch of unused underwear and a husband who hasn’t eaten anything in 24 hours. 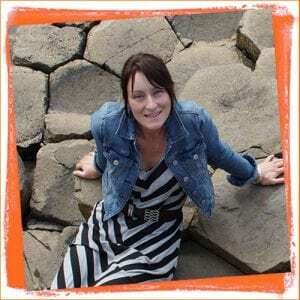 We ended up spending FIVE days in the hospital, and inevitably, I had to call my Wonder Women with a list of things I actually needed ASAP – because I had packed a lot of absolutely useless stuff. ♥ Socks that you could throw away. ♥ DARK, comfortable pants. 2 or 3 pairs. ♥ DARK, comfortable (preferably front opening) shirts. 2 0r 3. ♥A pack of these undies. YES, you need these. I figured the hospital would give me enough… nope. ♥ Robe. (For if it’s cold, and for covering up quickly. This is one thing I didn’t have that I will take next time.) If you get something super comfy like this, you’ll probably find you sleep in it at home too – for those first few busy nursing months. ♥ Camera (unless you will just use your phone). ♥ Basic toiletries (toothbrush / toothpaste / shampoo / moisturizer / deodorant). ♥ Pillow & blanket dad (can leave this in the car until later). Baby REALLY doesn’t need you to take a bunch of things to the hospital, I promise. The hospital has almost everything you’ll need. Really! ♥ Sleeper / coming home outfit for babe. 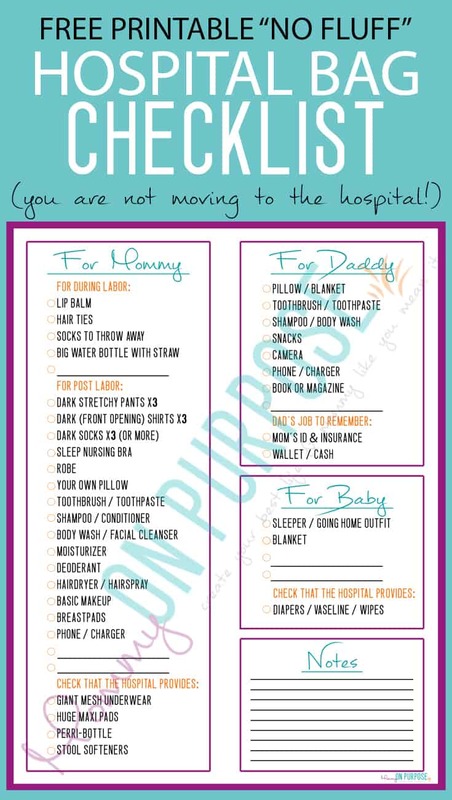 Grab this free printable hospital bag checklist here! 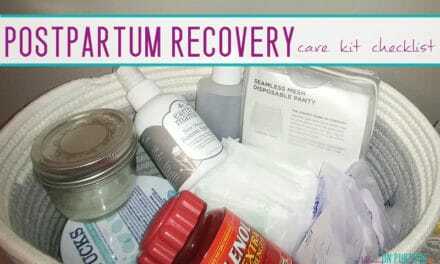 Your hospital bag for labor doesn’t have to be a big deal. 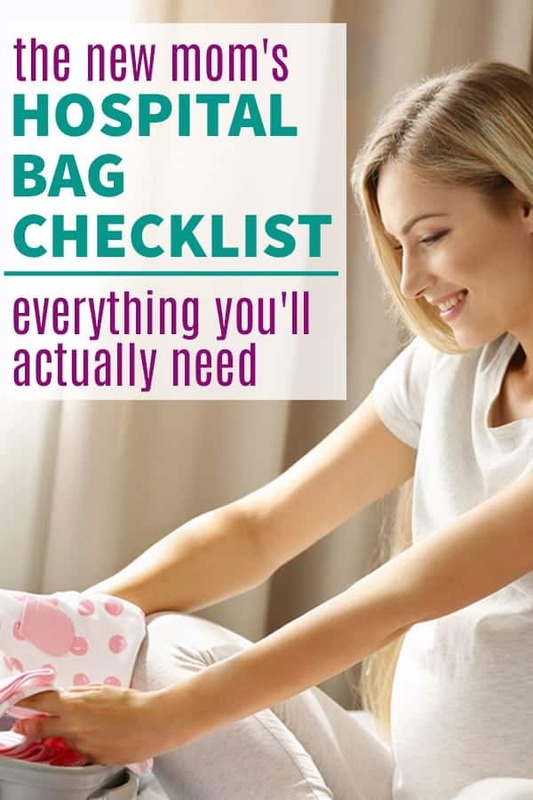 Don’t over stress about the checklist for hospital bag too much, and don’t hugely over pack. Even in five days, we hardly used half the things we brought. The pillows, the clean clothes, the toiletries, the snacks, and the phone and charger were the things we would have truly missed. 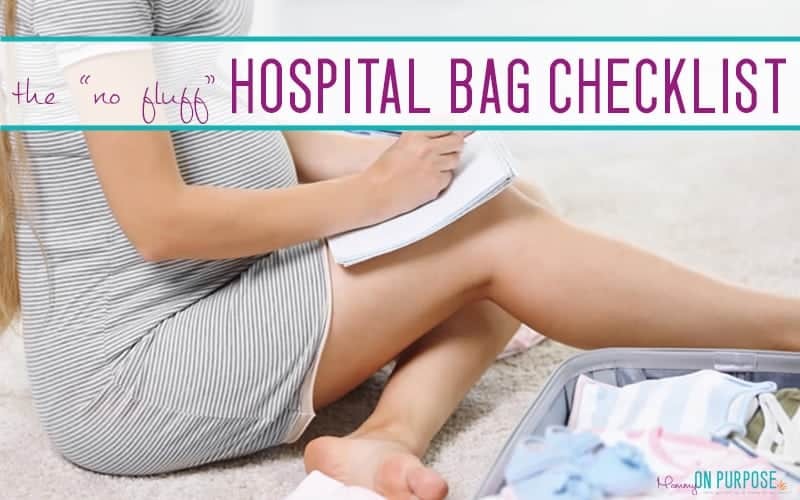 What essentials would you add to this realistic pregnancy hospital bag checklist? Are labor music and nursing nighties high priority for you ? Am I missing out by not having the fluffy stuff on my hospital bag checklist? Great tip! I don’t remember feeling hot but I definitely remember sweating, so it’s entirely possible that I was hot lol. You are so right! Four time mommy here and my bag looked pretty much like yours (minus the hair dryer, I’m a ponytail girl). Clothes for after delivery (comfortable and disposable, but something I wouldn’t mind being photographed in. I’d buy a set or two of inexpensive but cute pajamas). My favorite body wash and shampoo (that first shower after delivery is AMAZING, and having your own supplies helps you feel more like yourself after the emotional rollercoaster of labor and delivery). And definitely chopstick. And mints. Hospital air and controlled breathing means dry mouth and lips. Grippy socks for walking the halls (but don’t be upset at having to throw them away. I dripped all kinds of bodily fluids on the floor ?). Take advantage of all the things the hospital will provide and save your own stuff for when you get home. Did I mention all the bodily fluids? Ha! I was totally dying for lip balm too! Finally a nurse found me Vaseline. I don’t think they let me drink water though because I was a c-section. Thanks for posting a realistic list!! This is a good list and awesome advice i Remember the first time I over carried stuff. 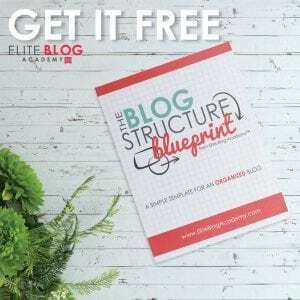 Thanks for this list and the printable comes just in handy when I need to. HI Frida!! SO glad you like the printable 🙂 Congrats on upcoming babe!! Thank you for this. I am a soon to be new mom and I just want to know what will be used and what won’t be while I’m in the hospital. I don’t really want to carry extra stuff if I don’t have to. Congrats on the upcoming babe Ashley!! I felt the same way!! I wanted a small pair of scissors or nail clippers to trim down (not remove) the darn ankle and wristbands. They were too long and kept poking the baby in the eye or back of the neck while trying to feed the baby. That would have been so helpful. I’ve never taken a robe and I always see it on people’s lists. I guess it could be nice, but I’m a “less is more” when it comes to clothing (I can’t layer or I go insane). Also wear my own clothes at the hospital?? Let someone else do my laundry + the gowns make for easier nursing access than a shirt. I don’t have disposable clothing and I hate wearing pants until I’m forced to leave the hospital. A giant pad +ice packs don’t fit in even my biggest maternity pants. I wouldn’t add anything, and this was much more realistic than other lists I have seen. I’ve never been allowed to drink while in labor, so a cup and snacks for dad are on the list, but once I deliver I get a 32 oz mug, so I don’t bring one for myself.